Each week, various titles from DC tied in to the MILLENNIUM main story to varying degrees. Unless there’s specific story reasons, they’re presented here in the order of the Millennium Checklist that you can find on the House Ads page. At the Green Lantern Citadel, Firestorm seems aloof, even though he hears other heroes whispering about what happened to him and how he has changed recently. 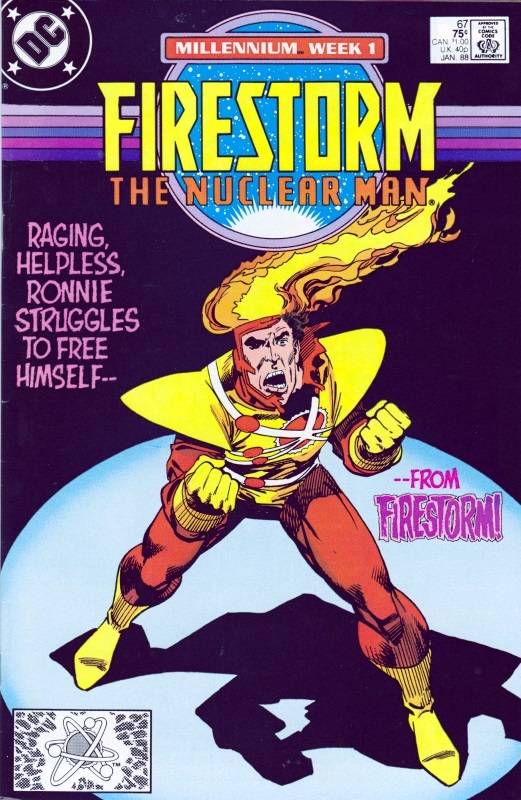 Outwardly, Firestorm considers himself a new-born hero, while within Ronnie Raymond and Mikhail Arkadin communicate with each other, at the same time trying to free themselves from the bonds that keep them trapped within Firestorm. Leaving the Citadel at the end of MILLENNIUM #1, Firestorm heads for the office of Prof Martin Stein where he is greeted by Bernard Ferguson, Chief of Pittsburgh Police, and a Manhunter. Recognising Firestorm’s confused state, Ferguson manages to convince him that he is a friend that can reveal the truth of Firestorm’s existence. Ferguson manages to ensnare Ronnie and Mikhail within Firestorm’s mind even tighter than they were before, and convinces him that he is to head to Louisiana and the secret Manhunter base where he will become their champion. In an attempt to free a friend from Soviet captivity, Flash runs afoul of the Russian speedster group Blue Trinity near the border of Finland. He is helped by the ex-Soviet speedsters called Red Trinity and receives word of the gathering at the Green Lantern Citadel. 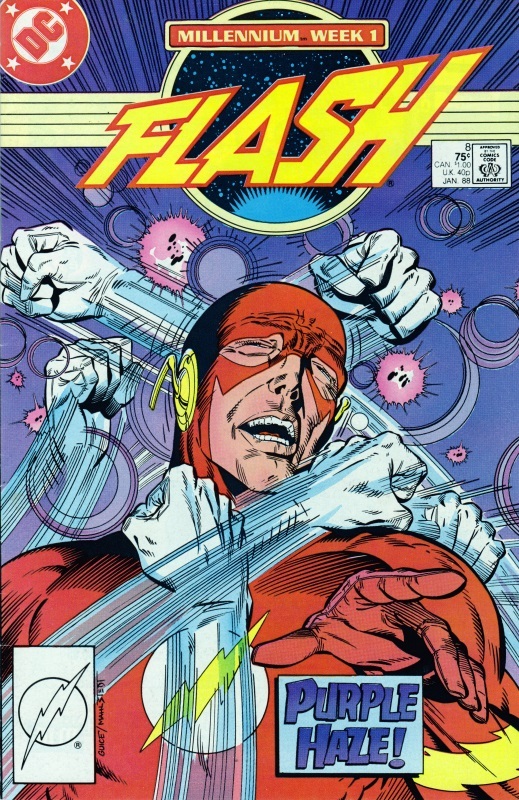 After attending the meeting, he heads home and finds his father, Rudy West, waiting for him, and is stunned when Rudy admits to being not only a Manhunter, but also to arranging a boating accident that has killed Flash’s mother. Taking advantage of his shock, Rudy signals for Blue Trinity, whom he is attempting to control, who capture Flash. Once again he is saved by Red Trinity who force Blue Trinity to retreat, while Rudy escapes in the confusion. When it is all over, Flash receives a call from his mother who had survived the accident, but she in turn tells him that his father is dead. 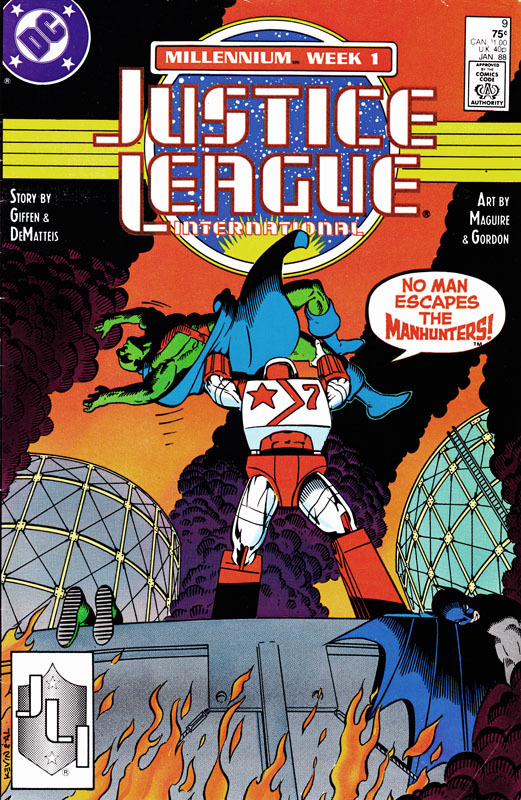 The JLI leave the Green Lantern Citadel, heading for their Paris embassy but before they get there, Rocket Red #7 announces that he is a Manhunter and tries to persuade the heroes to join him. Not surprisingly, they resist and the ensuing fight makes the shuttle lose control; the members of the team who were flying outside realise something is wrong and attempt to help. Rocket Red #7 exits the shuttle, sealing the other team members inside, and threatens to destroy the shuttle, forcing the rest of the team to stay back. Using his suit’s powers, he targets the shuttle towards the oil fields of Bialya, planning to crash it and disgrace the JLI in the process. The shuttle is stopped, however, by other members of the Rocket Red Brigade who have been called in by Oberon. The Manhunter is destroyed and the team are safe. In New York, Max Lord waits to hear back from the JLI but is shot several times by his secretary, Ms Wootenhoffer, before she is attacked in turn by the Construct who inhabits Lord’s building. 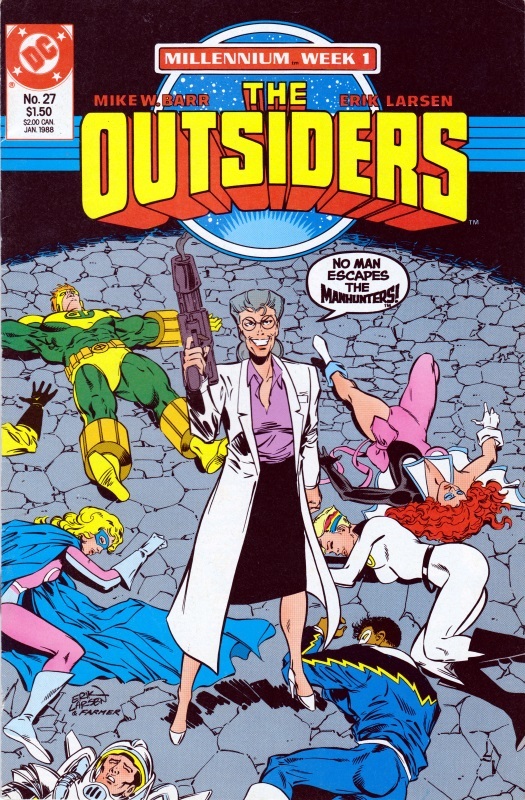 Dr Helga Jace reveals herself to the Outsiders as a Manhunter agent and gives them the chance to join her. When they refuse, she surprises them by having Metamorpho turn on them; in recent times, she had succeeded in changing Metamorpho’s appearance to be more human, but had implanted mind control within him, bending him to her will. Together, she and Metamorpho overcome the team and take them captive. The Outsiders wake in a post-apocalyptic world where the Atomic Knights, including their current team mate Gardner Grayle, struggle to survive. Caught up in the intrigues of this world, they help the Knights against one of their enemies, and in the final battle, Grayle makes a choice to save Windfall rather than his girlfriend from this world. That act allows the team to break out of the machine induced dream state they had inhabited, and attack Dr Jace once more. Looked uses her illusion casting powers to convince Metamorpho that Dr Jace is her and he attacks, forcing Jace to fire a weapon that destroys them both. 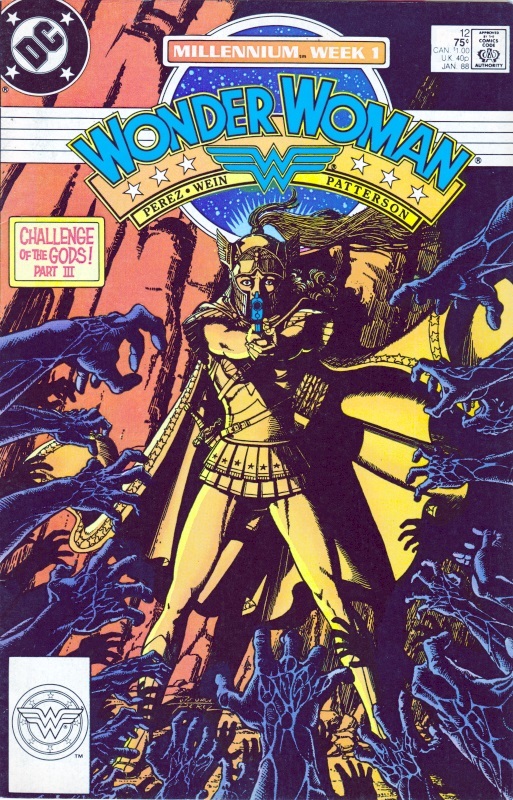 Undertaking a Challenge of the Gods, Wonder Woman has descended to Hades while her mother, Queen Hippolyta, follows. At the same time, Steve Trevor and Etta Candy have returned to Trevor’s home for the funeral of his father. While in Hades, Wonder Woman meets the spirit of Trevor’s mother Diana, who reveals that she had travelled to Themyscira years before and so impressed Hippolyta with her courage and self-sacrifice that Hippolyta had named her daughter after her. The god Pan sets dangers in the way of Hippolyta, including a very Jason and The Argonauts battle with skeletons grown from hydra’s teeth, before meeting Wonder Woman and sending her on her way to the Green Lantern Citadel. He warns/threatens her about the Manhunters, without making it clear whether or not he is one. This is very much a Red Sky Crossover issue which has little to do with MILLENNIUM.